I was asked what could be done to improve the power output of the GWS 12mm motor used in the PMFC E20 aka Ferry 500. I believe this was a frustration request targeting the seemingly invincible Mick P.
Accordingly, a few tests were run looking at battery capacity, propeller diameter and battery temperature using a Watt meter to measure volts, amps and Watts. The std propeller recommended is the GWS 3 x 2. Propellers of 3.5 and 3.75 diameter were made, cut down from a GWS 4 x 2.5. Regret that both pitch and diameter change but GWS do not make a 4 x 2. The alternative props have a 4 mm mounting hole so a prop saver with a 1.5mm mounting hole was procured from Micron. The standard battery capacity is a 250mah Hyperion G3 2s. Batteries of 180 and 120mah were procured. Tests were run at 10/20/40 deg C battery temperature. It is accepted (allegedly)that the CN12 motor is Ok at 2 amps current draw. This is achieved on the standard power unit set up giving a mean of 2.14 amps over a 12s motor run. Increasing the power input may well effect the durability of the motor. The test rig is shown below. Battery capacity : The motor power on a 180mah battery is much the same as a 250mah. Going to 120mah is not recommended with 16% drop in power. Increasing the prop diameter from 3" to 3.5" gives a power increase of 25% . A further increase to 3.75" improves power a further 5% but initial current draw exceed 3 amps and the motor is hot to the touch after a 12s run. 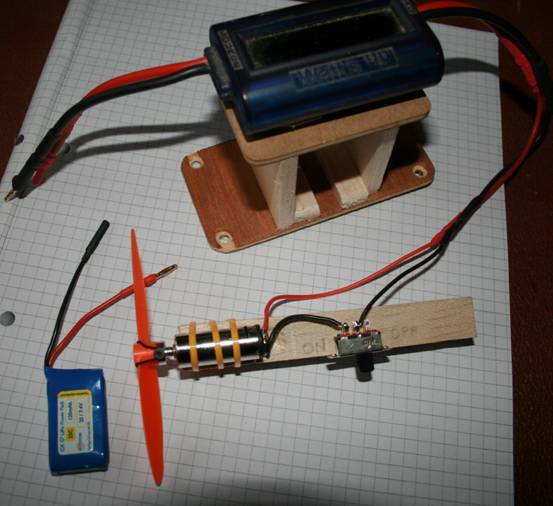 Battery temperature: If you want to go to the trouble of battery heating a 40C battery on a 3.5" x 2.5" prop gives a 42% increase in power over the standard set up. Recommendations : Reduce battery size to 180mah, make a 3.5"x 2.5" prop and heat the battery to 40C. This will give 43% more power than standard. A little more can be persuaded from the motor with a 3.75 " prop but you will be treading on uncharted territory. The following show graphically how the variables interact. Apologies if you find graphs difficult to interpret. If you want to view the base data in Excel format then contact me at the address below.